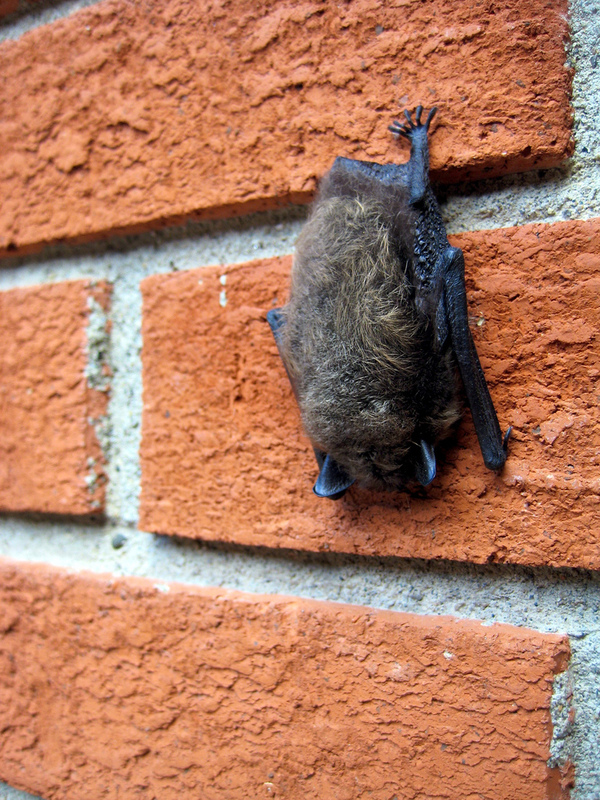 Do you need to know how to get rid of bats from your home? I’ve got a great, low-cost solution for you that is safe (for you and the bats) and is the preferred method of removal by “bat-friendly” organizations. In fact, it is probable that you live in an area that has laws in place that protect bats. Here in Georgia, a permit is required from the Georgia Department of Natural Resources when bat removal from a structure is necessary from May 1st through August 15th, the bats’ maternity season. Luckily, I discovered them in April and dealt with them in a timely manner. Check your local and state regulations, if bat removal is necessary. I had a small colony of Little Brown Bats (Myotis Lucifugus) roosting in the gable vent in my home recently. The screen on the inside of the vent prevented them from living in my attic, but they seemed to like the shelter and steady supply of warm air passing through the gable vent, so they would latch onto the screen while keeping warm and dry. It’s very typical of bats to roost in gable vents for the reasons I mentioned. Short of seeing them on your own, there are a few signs. I noticed the bat droppings (guano) in the driveway directly below the gable and knew something had to be done. There were over a dozen bats and I had to figure out how to safely get rid of them in a humane way. Bats should never be handled or harmed. None of the bats were hurt, maimed or killed and all of them found new homes elsewhere. That’s a win-win situation for homeowners and bats alike. How did I get rid of the bats without harming them? It was a very simple solution that did not require me to buy anything in addition to what I had already purchased for various projects around the house. I created an exclusion device that allowed them to safely exit the gable vent but did not allow them to re-enter. An exclusion device is a one-way valve placed over the exit point. You can make it out of plastic sheeting, like I did, or you can use fiberglass screen or bird netting. I came across the solution to my bat removal dilemma after talking to my neighbor. Locate bats – find the location(s) where the bats are entering and exiting your home. Cover with plastic sheeting – Cut a piece of plastic sheeting (I used 4 mil) large enough to cover the entrance with a couple of feet extra on the bottom half. Secure plastic sheeting – Temporarily tack the top and sides of the plastic to the entrance leaving the bottom open with a little bit of slack for the bats to slip out of when they are ready to feed at dusk. This will allow them to find their way out, but prevent them from coming back in because they are not able to cling to the plastic. Voila! No more bats in the attic. Leave the plastic up for a few days to prevent them from roosting in your home again. After a few days, I took down the plastic, cleaned the exterior of the gable vent, removed all of the guano that remained in a large crevice between the inside of the gable and the inner screen and re-attached it from inside of the attic. 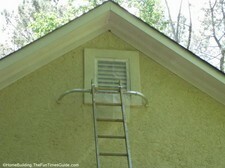 The final step was to make sure that the gable was covered on the outside. 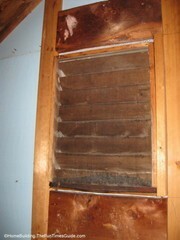 I measured the gable vent and cut a piece of fiberglass screen to fit. I secured it with a staple gun on the inner frame of the vent and trimmed any excess screen. I decided to take it a step further and provide them with an alternative home after the soon-to-come eviction. I bought a bat house and temporarily hung it in front of the plastic sheeting on the same day. I later learned that I should have hung the bat house next to the gable vent prior to evicting them. The plan was, when they returned during the evening or in the morning and couldn’t get back in the attic, they would simply take up residence in the bat house because it was in the same location as the vent. Unfortunately, they did not roost in the new bat house but I’m hopeful that they will find it again in its’ new location on the chimney. The bat house should be positioned to receive the first 7 hours of morning sun. The photo on the left shows the accumulation of guano and the photo on the right is after I cleaned it up. It’s a very messy, smelly job. You’ve been warned! Give them a new home next to where they are roosting, or at least attempt to do so. Let them fly out on their own. Don’t let them back in. Wear protective clothing – Wear a long sleeve shirt, safety glasses, and leather gloves. Contact health department if you’re bitten – Less than 1 percent of bats carry rabies but if you are bitten or scratched, don’t panic. Contact your local health department immediately and secure the bat for rabies testing. 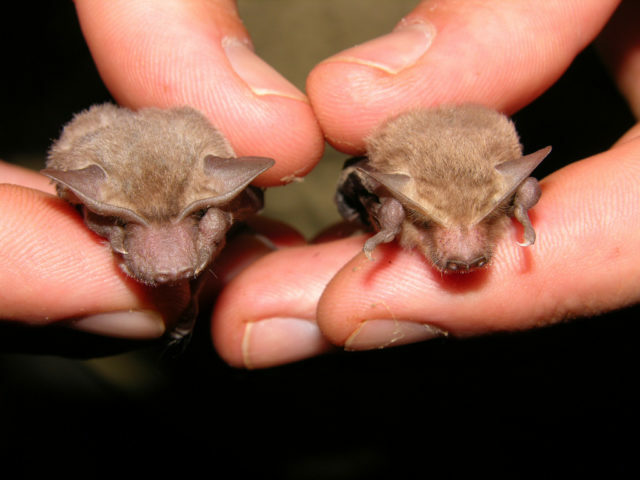 Never touch them – Never touch a bat with your bare hands. Never use chemicals or poisons – It is illegal. Contact authorities before bat removal – Check with the proper local and state authorities for regulations in your area prior to removal.